Karen is a professional curtain maker. She developed her skills through training at Cambridge Fine Furnishings. Karen has always loved fabric & colour, she has studied textile design as well as interior design. It was an absolute pleasure to be part of this stunning kitchen project. Thank you to our lovely client & to @kitchencraftuk for the beautiful showcase photos which include our Roman blinds & window seat. This stunning kitchen features bespoke roman blinds for the bay window & a side window which we made up in ‘Gingko’ linen, created by British designer Jessica Hayman of Rosa and Clara. The linen was printed in Lancashire & a pleasure to work with. We made the large, shaped window seat in Susie Watson striped heavy cotton fabric. Our client chose Zoffany Prussian & Dove designer paint for the walls & kitchen which has oak dovetailed drawers. Gorgeous Mandarin Stone flooring runs throughout the kitchen & into the large light filled dining room over looking the garden. The first five months of this year have been proof that many of my customers are still in love with restful grey interiors. Each one of these clients chose their own version of the perfect grey in whichever texture or grey tone they preferred. Some are silvery, some with steel or lilac, aubergine or charcoal undertones. There are a myriad of grey fabrics to chose from. Incredibly the human eye is able to distinguish over 50 shades of grey. Grey is often associated with sophistication, elegance, calm & can be the perfect neutral or accent. Add a pop of bright colour or pastel shade & it changes the tone of the room. Add some texture such as luxurious velvet or linen, or add metallics & the scheme is altered completely. Don’t hesitate to ask if you would like me to help you find your perfect grey fabric! I’m thrilled to offer an exciting range of designer wallpaper. These gorgeous hand painted art designs have been digitally printed onto heavy weight non woven wide width paper to really enhance the designs. I have the collection available to show you & can of course supply wallpaper & fabric samples directly to you. I’ve just treated myself to inspirational day out with a lovely group of soft furnishers at a Curtain Masterclass. The Masterclass was led by industry expert Rebecca Day of Merrick & Day who generously shared with us her huge knowledge, experience & tips for designing window treatments. 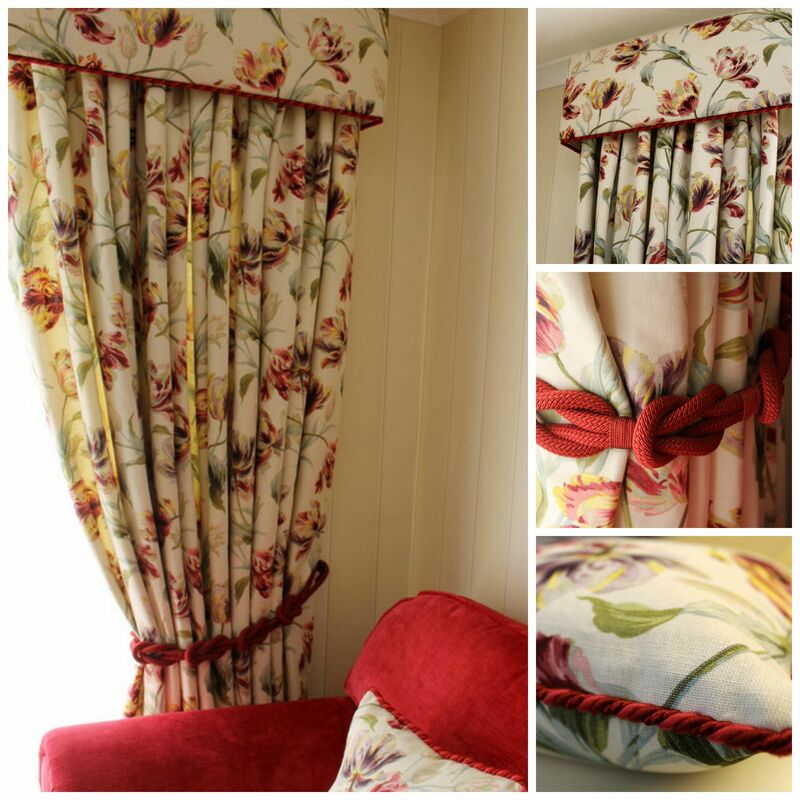 Rebecca brought some of her gorgeous samples with her which demonstrate just how beautifully a contrast binding, leading edge or trim can enhance a contemporary or traditional curtain. Rebecca’s own style has changed over the years & she now favours a more relaxed style of curtain & heading which I agree is very pretty. I’m looking forward to using some of these enhancements on future projects. Thank you so much to our host Penny & her staff at Denton Drapes couture soft furnishings. My only complaint is that the day was over all too quickly! My client, who loves the Laura Ashley, country house look wanted to up date her sitting room but maintain a traditional feel. 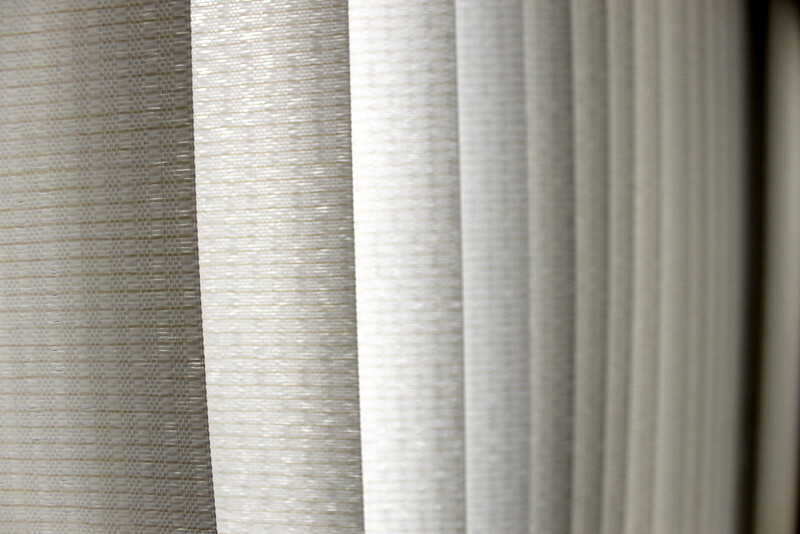 As the room is south facing & has large patio doors out to the garden the furnishings are liable to fade in the strong sunlight; my client chose these textured vertical blinds from my made to measure selection to protect the furnishings & maintain a cooler temperature on sunny days. The room was newly wallpapered in elegant Colefax & Fowler Elwick Stripe. The client had a heavily shaped pelmet which we took apart & re-made into a straight more contemporary shape. The edge was highlighted with a two tone berry shade braid which also picks up on the colour of the stunning new sofa. The same braid was used to embellish cushions. Although it was a long wait for the tie backs to arrive from the French, high end trimmings company, Houles, my client was truly delighted with her choice. These tie backs are made up of loops which are available individually in a choice of colours to create your own original tie backs in any length.